First live biofilm chemical imaging with submicrometer resolution using time-of-flight secondary ion mass spectrometry enabled by SALVI, a multimodal microfluidic imaging tool developed at Pacific Northwest National Laboratory. Scientists can now see biofilms, structured communities of microbes, in 3D and real time thanks to a laboratory instrument developed at Pacific Northwest National Laboratory. The instrument-a microfluidic reactor called System for Analysis at the Liquid Vacuum Interface, or SALVI-won an R&D 100 Award in 2014 for enabling the first-ever imaging of liquid samples in real time and space by instruments that previously could only accommodate solid samples. 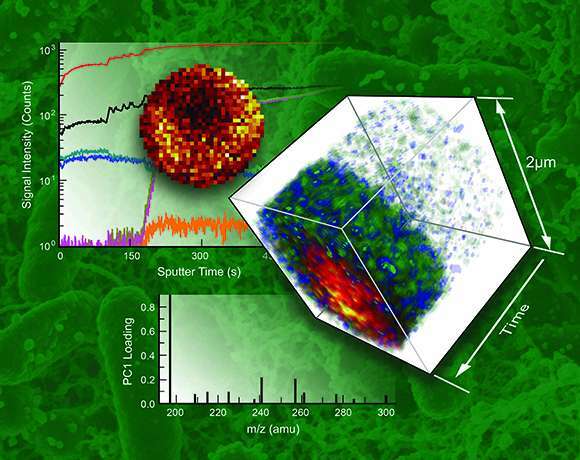 SALVI recently produced the first 3D images of live biofilms using time-of-flight secondary ion mass spectrometry (ToF-SIMS), providing a fresh view of these complex structures. The images showed the distribution of various concentrations of key biomolecules (fatty acids) at the interface where the biofilm attached to a surface for colonization, giving scientists more insight into the role they may play in contaminant fate and transport in the subsurface. These insights may one day help eliminate corrosion in pipelines, prevent gum disease, or reduce barnacle growth on marine vessels. These results were published in the journal Biomicrofluidics as a high-impact, fast-track article because, as one reviewer noted, "the article will catalyze new research in this area," as it overcomes the basic problem with biofilm imaging-loss of molecules during delivery to the mass spectrometer-and produces impressive submicron 3D chemical mapping. The images help bring scientists closer to understanding how these biofilms grow and interact with the surfaces they colonize, which can include teeth, ocean vessels, medical instruments, pipelines, and more. The ultimate goal is to predict and influence the biofilms' role in basic energy, industrial, and biogeochemical research. SALVI overcomes the limitations of ToF-SIMS, which is widely used to analyze organic and biological molecules in complex biological systems. The vacuum-based ToF-SIMS generally requires solid (dried or frozen) samples. SALVI enables ToF-SIMS analysis of liquid samples in real time. The key to SALVI's ability to provide these images is a microfluidic cell that allows wet imaging in a vacuum, something not previously achievable. Microfluidics provides unprecedented control over flow conditions, accessibility to real-time observation, high-throughput testing, and mimics in vivo biological environments. The research was done at EMSL, a national scientific user facility sponsored by the U.S. Department of Energy's Office of Biological and Environmental Research, where the SALVI microfluidic device was developed and the first liquid ToF-SIMS measurements of complex interfacial phenomena of biological systems were obtained. The PNNL team plans to make SALVI more applicable to other imaging modalities. Future studies will couple SALVI's results with real-time metabolic measurements.